As well as being fun and enjoyable, our team building and training activities all focus on five areas of development and tie into the model, originally proposed by Patrick Lencioni in his best selling book "The Five Dysfunctions of a Team. Patrick Lencioni's dysfunctions are important for a number of reasons and they all tie into each other. If you're team don't trust each other and are overly guarded with each other, they won't co-operate to create the best results. In fact, in poor scenarios you will find negative and blocking behaviours, costing the business a great deal of credibility and money. If your team don't trust each other it's very unlikely that they'll put their head above the parapet. This thwarts all chance of creativity and new ideas as well as creating quite an uncomfortable atmosphere. Without healthy discussion, getting buy in, consensus and engagement is nigh on impossible. People might say they agree but in reality, there will be a lot of back biting, coffee break chit chat and not a lot of concerted action. This happens when people avoid any kind of difficult conversation because they don't know how to positively go about it and/or they can't tolerate the discomfort that comes with it. It also happens when responsibilities are ambiguous. The result is that mistakes are made, stuff doesn't get done and standards aren't met. This happens when people care more about something other than team goals. It could be where gaining individual status or power conflicts with the greater good (think politics) or where the results of the team are not fed back to those achieving them. Teams that are not focused on results will often be full of friction and not perform well at all. The solution to Patrick Lencioni's dysfunctions is to create an environment and framework that nurtures positive team behaviours to overcome these dysfunctions. The base of which is creating an environment where people can be open, curious, vulnerable and trust each other. A place where they can safely disagree with one another to create better solutions for the business. Somewhere where they are clear as to what they need to achieve and will support decisions, because they've been heard - even if they don't fully agree. Accepting the discomfort, a place where behaviours are criticised and better solutions are found, without the people blame. A place where the whole team are focused on achieving results and group successes are shared and celebrated over individual achievements. Although there is no magic wand to transform a dysfunctional team into a functional one, there are inputs that can help. At Meon Springs, we focus on ensuring the right inputs are selected to make your Team Development as powerful and enjoyable as possible. Using a combination of team building activities and training inputs, we can design a day that focuses entirely around this. Overcome inhibitions and fears with peer group. Give and take constructive criticism of behaviours. Understand and appreciate other perspectives. There is nothing better than a team working on a shared problem that requires them to work together to get a result. In this area we have and continue to design Treasure Hunts, Escape Rooms and a number of other challenges that are active, fun and engaging. Much of the development comes in reflecting on the challenge, looking at what happened, why that was significant and what to do next. Without a great vision and good organisation, teams cannot function properly. Based on scenario planning, constraints management, scheduling systems and project management skills we have and are developing a number of training workshops, which help businesses fill the gaps in this crucial area. We also do this in a fun, interactive and experiential way. 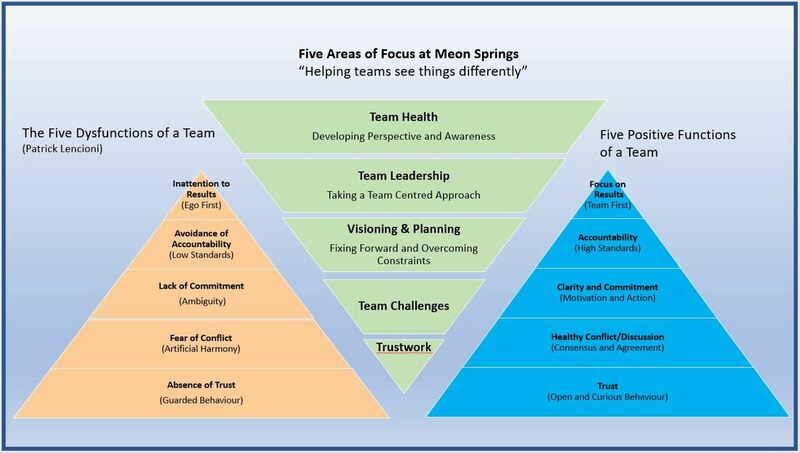 The fourth area is Team Leadership. Without good leadership, teams simply cannot function. Our preferred style of leadership is one whereby those doing the work have as much responsibility and accountability as they want or are able to take. This requires very careful management and a lot of skill and trust of business owners. It does however produce the most functional and scalable type of business that you can have. The final area is around perspective and awareness. Without a good sense of perspective and a healthy dose of self-awareness much of working life can become overwhelming, depressing or full of anxiety. For this we are developing a series of workshops around this area, with the aim (in thinking terms) of helping team members separate the chaff from the wheat.